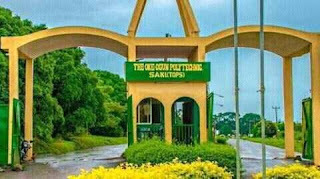 The Oke-Ogun Polytechnic, Saki [TOPS] National Diploma [ND] Full Time Acceptance Fee Payment, Admission Clearance and Registration Guidelines for 2018/2019 Academic Session. The Oke-Ogun Polytechnic, Saki [TOPS] wishes to inform all newly admitted students into the various National Diploma [ND] Full Time programmes that they are to procced with Acceptance Fee Payment, Admission Clearance and Registration Guidelines for 2018/2019 Academic Session. CLEARANCE EXERCISE BEGINS ON MONDAY 29TH OCTOBER, 2018. PROCEDURE FOR PAYMENT OF ACCEPTANCE FEE, ACADEMIC CLEARANCE & PAYMENT OF TUITION FEE. Note that under no circumstance would the date for the payment of Acceptance Fee be extended.